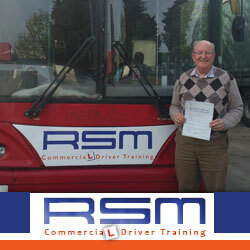 Here you can read what our clients are saying about our driver training courses and our driving instructors. ⭐️⭐️⭐️⭐️⭐️ Having always been fascinated with trucks, I decided to follow in my father’s footsteps and become a driver. I found RSM online and their website was informative with great reviews. 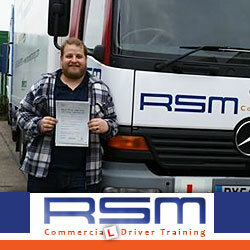 When I contacted them they advised me of everything I needed to do to get my licence. 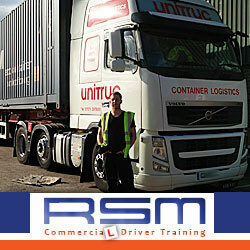 The team were very professional, helpful and keen to get me trained-up. ⭐️⭐️⭐️⭐️⭐️ Thank you to everyone at RSM for their professionalism and thorough training! 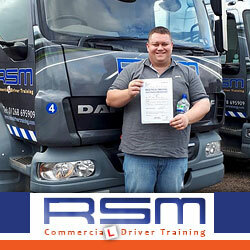 I took my HGV Class 2 and had Kevin and Woody for my lessons. They both were amazing! Their attitude and commitment to the course were second to none and they made every effort to make sure I was confident while I was driving and ready for my test. Many thanks to the girls in the office for making the process of booking the course very easy and straightforward. The girls were also very helpful with any questions I had before taking the course. 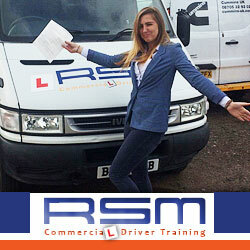 I passed my test with RSM today and must say it has been a shed load of fun this week training for the big day ! I booked a crash course for a C1 licence for my paramedic training and passed my licence today! I couldn’t thank my instructor Maggie and all of the staff at RSM enough, they’re so very kind and welcoming, especially as I was very nervous! All the training I have received has prepared me to pass my test today with a high level of competence, confidence and skill! Fantastic company! Great staff! Instructor was awesome! Only had 16 hours with him and I passed first time. Just passed my C1 thanks to this brilliant company and my amazing instructor Kev. The training was very thorough and all the staff at the training center made me feel very welcome and relaxed. I have already recommended this company to many friends looking to complete the same course. 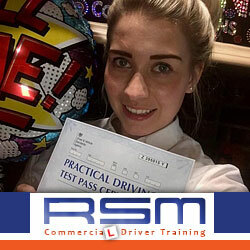 My Trainer Treena was superb, she was very knowledgeable taking me on plenty of different routes and provided all the relevant information that I needed to know to pass my test (first time) Everyone in the office was friendly and approachable and nothing was too much trouble.. I have been able to drive sports teams and assist other colleagues in getting to fixtures helping to save the school money on transport costs”. 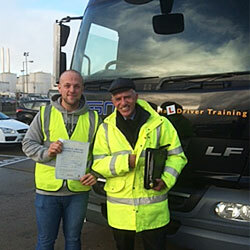 Had my Class 1 and Class 2 with Tony; excellent trainer – passed both 1st time with 1 minor. Wouldn’t recommend anyone else great team down at RSM ! I was unsure if (because of being a women) I would be accepted in what has mainly (until recently) been seen as a predominantly male industry. 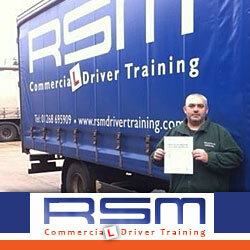 RSM gave me first rate training, which gave me confidence behind the wheel and in my own ability as a driver. I couldn’t be happier, spent the week with Geoff training and passed 1st time. – Great school, lovely people, top training. 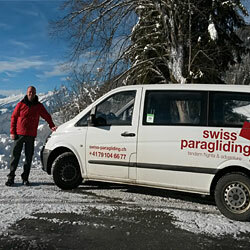 I felt so comfortable and relaxed as the instructors were so friendly. I passed my class 2 and am now waiting to do my class 1 and I wont go anywhere else. I really bonded with the instructors and feel like i have friends for life. My instructor was Tony and what a legend, really good at his job and really honestly wants what is best for the learner. I can honestly say they adapt to how YOU learn best – One on one so I had all there dedicated time. Highly recommended. 5 stars all round. Thanks guys!!!! 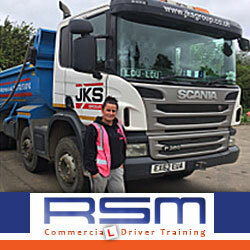 A few members of my family are lorry drivers and I wanted to better myself and further my career. Training at RSM I felt at ease from the beginning of the course. Very friendly environment to learn in, great vehicles and fantastic teaching methods. I passed first time and am very satisfied. I will now be going to work full time driving dust carts. 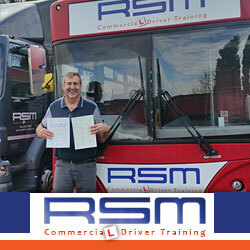 Passed my PCV first Time! As a small tree service provider efficiency is key, which is why this test is vital to providing an efficient service. Our team are all under 33 years old which means we are all post 1997 drivers, this means unlike those lucky pre 1997 drivers we now need another test, which is the b+e entitlement. 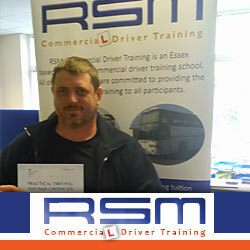 We recommend RSM Driver Training, should you require passing the b+e trailer test in Essex – Thanks to Treena at RSM Training Basildon for helping me pass. I was looking for a change in direction at work and after speaking to a friend decided that HGV driving would be the direction to take. I was recommended to go to RSM by a friend and I found the staff professional and helpful. 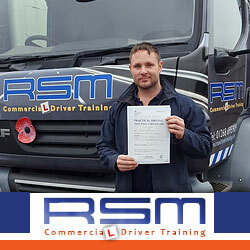 I was lucky enough to pass my HGV 2 then 1 first time, then through another friend was taken on by a small company in Tilbury, I’ve been with the same company for nearly two years now and love it. It’s a steep learning curve when you start, but well worth it, I now drive a Volvo FH16 which I’ve been driving since new and deliver containers to as far as Bristol to Birmingham. 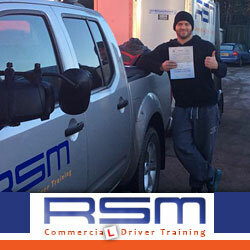 So, if you want a job that has security, well paid and you are left on your own , contact RSM and pass your test ! I undertook my C1 Driver Training last week and passed my test on Friday. 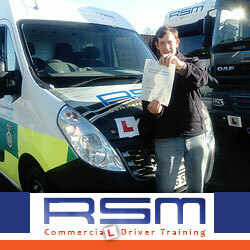 I would like to take this opportunity to thank my instructor Mick as he is the sole reason I passed my test. I could not have asked for a better instructor and I believe Mick’s instruction is the reason I felt confident so early on. He made me feel so at ease and really pushed me to do the best I could. I owe a big thank you to Mick and the RSM team for making me feel so welcome and getting me over my last hurdle before I become a student paramedic. Best wishes for the future and thank you again. I would like to thank everyone at RSM. I had a great 4 days training. A big thanks to Treena. 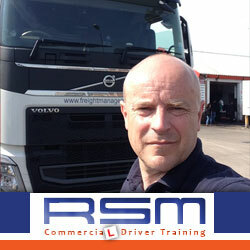 I highly recommend RSM to anyone thinking of any driver training. Class 1 next so could be seeing you soon. I would like to thank you all, especially Treena, for your help and involvement in my successful PCV training. It has long been a wish of mine to drive something bigger than a car and, latterly, to provide cover for our Cricket Team coach driver when we play matches away from home which involve a stay away of more than a week. Treena stayed positive for me after my second test failure and was determined to get her oldest student through the test, come what may! I did the course for a change of career. I found Treena’s style of teaching easy to understand and informative. The bus is simple but effective and very good to learn with. I never passed first time but when I did it was with 0 faults !!!!!! Thank guys. I will be back for a few Coach lessons next. 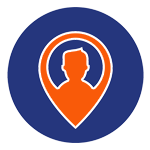 I would highly recommend this company as they are just so friendly and helpful. Great driving school, the DSA instructor Geoff was easy to get on with, gave clear instructions and helped me relax whilst learning to pass my C+E test. AMAZING instructor! Could not have done it without him. Help and support throughout. Absolutely fantastic! A quick message to say thank you to my instructor Tony for teaching me and giving me the confidence to pass my test first time! 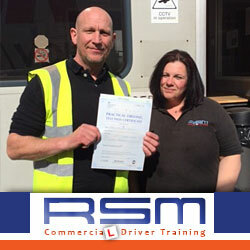 – And to thank everyone at RSM for helping to get my Cat C licence. ⭐️⭐️⭐️⭐️⭐️ Just want to thank everyone at RSM especially Brian and Tony who managed to get me through my Cat C then my Cat C + E FIRST TIME! 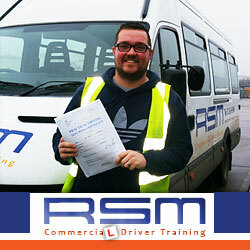 All instructors are very professional and give excellent one to one training giving you the confidence to go into a test to pass. Vehicles used are also good quality. Alina very well organised in the office and always has the right answers for what you need to know. Thanks again, would recommend to anyone, will be coming back to you soon for my CPC training. 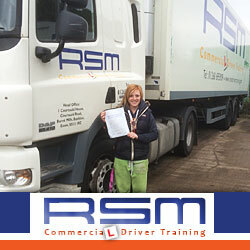 Thanks for helping me pass trailer test and thanks to Treena – awesome instructor! 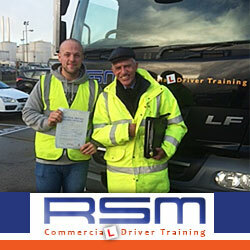 I would like to express my gratitude to RSM for helping me pass my C1 test. Special thanks to my instructor Mick who I’d like to thank for his patience and brilliant teaching, believing in me and giving me the confidence to pass the test. Will highly recommend this company in the future. 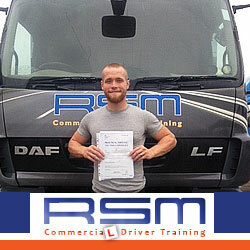 I would like to thank all of the staff and the instructor (Tony) for helping me pass my LGV test I am so glad that I went with RSM. Tony Bensusan; brilliant instructor, passed 1st time, couldn’t recommend them enough, thank you Alina and all staff at RSM can’t thank you enough. Great team at RSM can’t recommend them enough, thank you all for getting me through! For anyone looking to do it – 5 star + thanks again. I’m over the moon and you have sent me in the direction I needed, RSM are a life changer! ⭐️⭐️⭐️⭐️⭐️ From the age of when I can remember as a child; I wanted to become a lorry driver. When I was 15 I worked for my uncle who owns several lorries. My uncle’s employees would take me out in the 20 tonne tippers. I remember thinking one day I want to drive lorries. When I left school I left with no GCSE’s at all. People just thought that I could not be bothered to learn; in 2004 I was diagnosed with dyslexic and learning difficulties. Most people didn’t have the time of day for me, as I am slow in what I do and it takes me a long time to understand things. Later on in life I was then diagnosed with Asperger’s Syndrome, ADHD and Mild chronic dysthymia. In the back of my head I was thinking that I would never be able to get my driving licence. 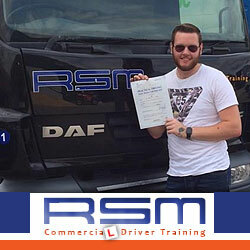 I then Met my wife and herself and her family got me on the straight and narrow and helped me get my driving licence in 2008 I passed my test and then a few years later I started to study my HGV theory. Now I have passed my test in 2015. 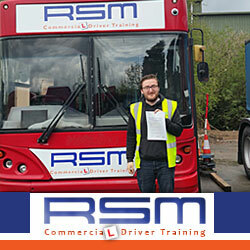 As I passed my HGV Class 2 I would like to thank Tony & Katrina at RSM who are instructors that can support and understand people with learning disabilities to provide the appropriate training. On my first day of training I arrived, and to be honest I was a little nervous pulling into the lorry park whilst parking in the car park, thinking about how I would get on and how my day will turn out. 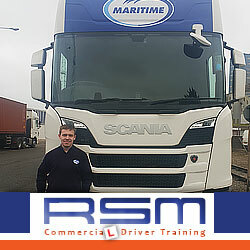 RSM made me feel welcome and after a while I felt comfortable to be myself. I would definitely recommend this company for people who have learning disabilities. If you have learning disabilities and you think you could never be a lorry driver then THINK AGAIN! Just think positive towards yourself and you will be able to achieve what ever your ambitions are in life. If you have the ability to drive a lorry and you want to drive a lorry then DO IT and don’t give up. Best of luck for everyone for your future.